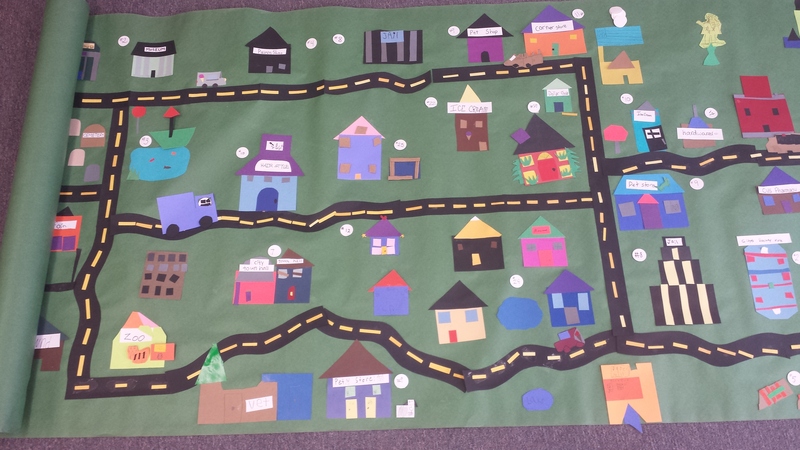 || Description: This is a paper mural that involves each student creating their own piece (a building, car, natural feature, road, etc) to add to the map. The items are then placed on the mural to plan where they can go. Once a good plan has been decided, the items are glued down. Students (or the teacher) can add the buildings to a key, which then gives them a corresponding number that they can place next to the building. This project encourages students to think critically about working within the framework of a larger project, including scale (how large their piece is) and whether or not it fits into our town. It also teaches the fundamentals of map-making. For example, humans and animals do not go onto a map (unless they are part of a symbol for a building) and things like cars and roadsigns don’t need to be on the key. This project also strengthens shape recognition, since the buildings are made mostly of basic shapes. The town could represent a specific place, such as the town of the school or a major city. The map could focus on one part of a town or have a certain theme. The project could focus more heavily on the geometry, requiring students to name the shapes (for younger students) or name/measure angles (older students).